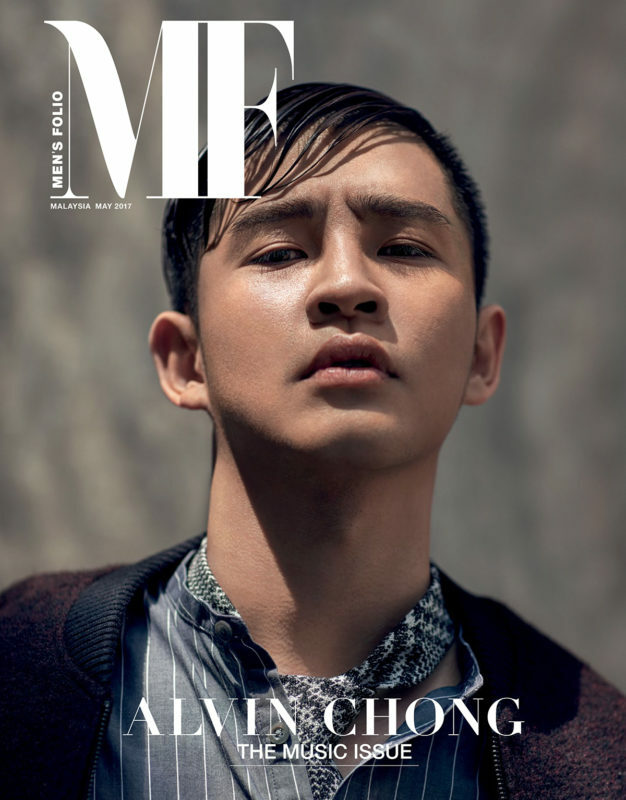 From singing and song-writing to making it as an actor, multi-talented Alvin Chong proves that success comes from maturity and now, he lands on the cover of Men’s Folio Malaysia’s May 2017 “Music” issue. As a singer, Chong first shot to fame after winning the Astro Star Quest competition in 2009. Eventually, he expanded his talents – adding acting and songwriting to his showbiz resume. The Penang-born lad garnered local accolades for hit singles The Days Without You and Sadly It’s Not You, of which he wrote himself. He even opened for Hong Kong stars such as Eason Chan and Justin Lo, as well as homegrown artist Nicholas Teo during their Kuala Lumpur concerts. Surprisingly, his big break into the Malay entertainment market came about when he landed a supporting role in the drama Suri Hati Mr Pilot, alongside popular actor Fattah Amin. Today, he is the new face of SPAO in Malaysia. And that’s why, for our cover shoot, Alvin is all decked in SPAO’s finest and looking dashing as ever. In line with our shoot, we sat down with the star himself for a quick chat to talk about his humble beginnings, his success and his plans moving forward. Tell us about growing up in Penang. I guess you can say that I learned how to take care of myself from an early age. I had to help support my family when I was still studying. I then got a scholarship to study graphic design, which was the reason why I moved to Kuala Lumpur. You currently have close to 300,000 followers on Instagram and nearly 40,000 on Twitter. Is being in the limelight something you are comfortable with? I’m getting used to it. I’ve been featured more in the media these days and I think fans are recognising me when I’m out in public. Partly, it’s because of social media. People are also taking me more seriously too. Do you see yourself as a fashionable person? This is actually the first time that I’m a face of a fashion brand. I’m excited about it, but I’ll be honest and say that I’m not much of a “fashion person”. Do you think fashion plays an important role in the life of someone who is constantly in the spotlight? Yes, of course. As humans, we are always judging one another. First impression matters and the image does count for something. Career wise, how did you first get into singing and eventually acting? I was singing in cafes back in high school. At that time, I also joined several talent competitions such as the Astro Star Quest competition, which eventually led to me being offered a contract. It’s funny, but I was quite reluctant to go into acting at first. I wasn’t sure whether I’d be good at it, and I thought I would screw it up. I told my management company that I didn’t want to do acting. Eventually, I gave in. You are very well received for being a versatile Chinese actor who is fluent in Malay. Did you grow up speaking the language? I grew up speaking Mandarin and Hokkien. I picked up English and Malay only in KL. It was difficult. I learned by watching television and by reading the subtitles. I also listened to radio programmes in those languages and forced myself to speak using what I’ve learned. Why did you decide to make the jump to the local Malay entertainment scene? It was a risk that I took. Chinese entertainment is a niche market in Malaysia and I wanted to try something fresh. At the beginning, detractors told me that I wouldn’t be able to make it. My Chinese fans also said that I was focusing too much on the Malay market after I made the move. To me, it’s not one or the other. I have continued to release Chinese songs even when I began acting in Malay dramas. What would you say is the factor that has contributed to your success? I’m not afraid of trying anything. I started from zero. So I’m not afraid of losing as well. I’m happy that I’ve made it all. I’m not afraid to ask for help when I need it. I guess my ultimate goal is to start producing content. Like a producer or director. Maybe even talent management. I see myself more as an entertainment entrepreneur. I’m not afraid to ask for help when I need it. I guess my ultimate goal is to start producing content. Like a producer or director. Maybe even talent management. I see myself more as an entertainment entrepreneur. Photography: Chuan Looi/Yipieyaya Studio; Styling: Sarah Saw; Makeup: Susan Lim; Hair: Calvin Wong/Groom Artistry; Outfits: SPAO. To read the full interview story of Alvin Chong and to see his exclusive photoshoot with us, get your copy of Men’s Folio Malaysia May 2017 issue at the nearest newsstands and bookstores or subscribe to our digital copy at www.magzter.com. MF COUCH: Alvin Chong on his new single "TAJAM"